Thompsons, on the seas — Sail the Caribbean with Thompsons on board the Disney Wonder. The Disney Wonder, an ocean liner that inspires awe and glamour of an old era, is the second Disney cruise ship after the Disney Magic. Let Thompsons plan your journey of discovery on this beautiful vessel. Born in the shipyards of Italy, The Disney Wonder is a breathtaking ship that combines the Italians’ excellent engineering, with their well-known craftsmanship and ingenuity. The ship was built in the Fincanteri shipyards. After the successes of the Disney Magic, and its groundbreaking innovative designs, power and speed, meant the Disney Wonder was going to be bigger; better and more glamorous, all the while providing luxury accommodation and fun for the entire family. 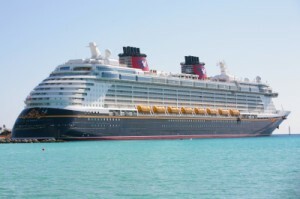 Since the Disney Wonder – whose maiden voyage was in August 1999 – there have been many other ocean liners who have joined the Disney Cruise Line fleet, including the Disney Dream, whose maiden voyage was in 2011, and the Disney Fantasy, whose maiden voyage was a year later. Although the Disney Wonder shares some external aesthetics with her older sister, she differs internally, with internal features that reflect the majesty and mysterious beauty of the oceans. Swirling patterns, reminiscent of the waves on which she sails; marble and Venetian glass add to the brilliance that is her tribute to the Art Nouveau decor of old. Sail the seas for a glorious seven nights and experience the beauty of Florida; the Cayman Islands and Mexico. In between the ports, you can discover the absolute marvel of the Disney Wonder; from the many wide, sunny decks; to the modern comforts and nautical decor of the staterooms. The Disney Wonder is perfect for families and provides a family-orientated service that is the first in the cruise line industry. Take advantage of the special offer from Thompsons, valid from 01 March 2014 to 08 March 2014, for only R22, 257. Price includes return port transfers; 7 nights aboard the Disney Wonder in an inside cabin and all meals and entertainment on board. Contact Thompsons, on 0861 84 6677 for more information. All prices are based on cabin types and flight classes available at the time of packaging and are to be used as a guideline only. Prices are subject to availability.